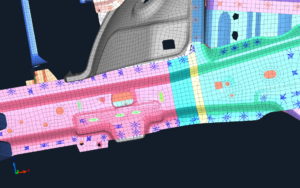 Typical Design Enablers available as automated ‘ready-to-use’ CAE solutions include: a) Beads, b) Darts, c) Bulk-heads, d) Reinforcements, e) Holes/Slots, f) Part extension/contraction, g) Shell rib, h) Tetra-rib, i) Tailor Welded & Rolled blank – TWB/TRB etc. The Design Enablers can be executed as an integrated solution complete with properties, materials, connectors etc. 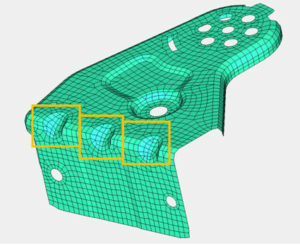 Shape changes like increasing or decreasing the size, translating or rotating a portion (Morphing) on a FE model is done with ease of access as per user requirement. 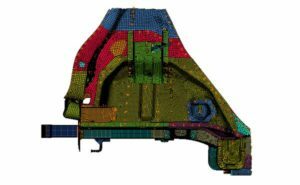 Moreover each and every shape changes applied can be reviewed individually that will be useful for comparing the variation. 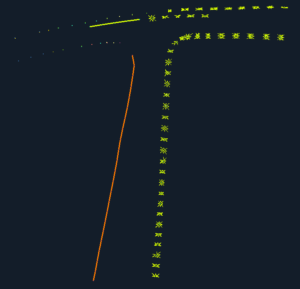 Gauge parameters can be created for multiple parts in a single step very easily & elegantly. 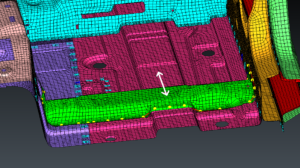 Gauge thickness can be assigned to any given FE model in a simple way. 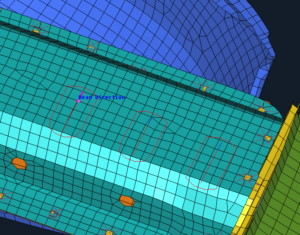 Weld parameters are useful way to optimize structures after design freeze for components/parts. 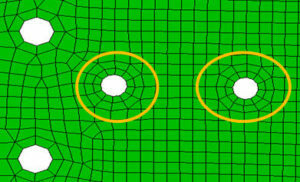 Weld parameter helps realize welds appropriately after shape changes or morphing as well. 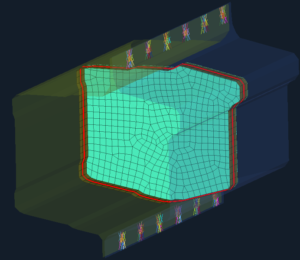 MeshWorks weld parameter tool helps to optimize number of welds and their pitch for spot weld. 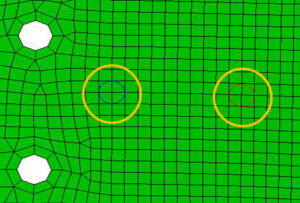 Doubler parameters are created to increase local stiffness for NVH applications. 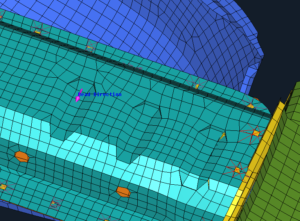 In MeshWorks Doublers can be created without CAD. 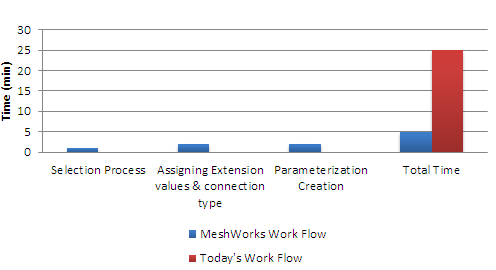 The resulting thickness penetration if any is automatically taken care of by MeshWorks. 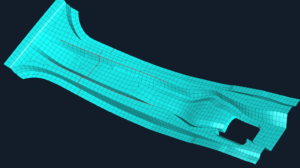 Bulk head parameter is excellent tool to improve sectional stiffness without much mass penalty and at the same time improve energy management during crash events. 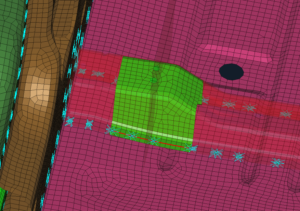 In MeshWorks, bulkheads and its connection could be co created without waiting for CAD. 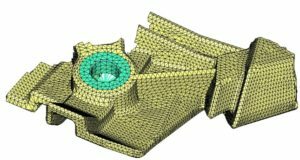 Bead/ Crush initiator parameters are created to increase stiffness for NVH applications and to initiate crush during crash events. 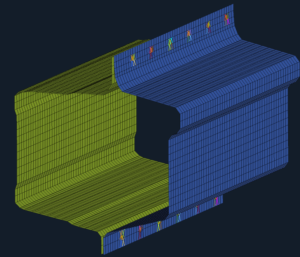 In Interior trims shell ribs play important role in energy management during head impact. 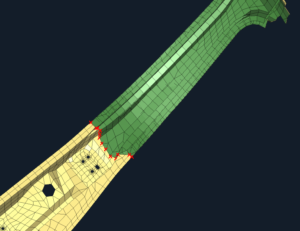 In MeshWorks such shell ribs could be inserted into FE mesh of trim parts for quick evaluation of the countermeasure without the need for CAD data. 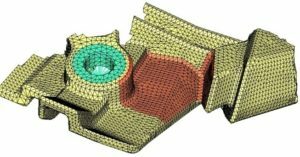 Part extension option is normally used to improve and tune the structural performance of the vehicle in Crash or durability events. 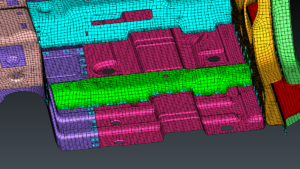 Part extension or contraction can be carried out without CAD in MeshWorks. Additional Packaging and shape change consideration to the body sections are not generally required. Tailor welded blanks is important performance tuning option for energy management in Crash events. 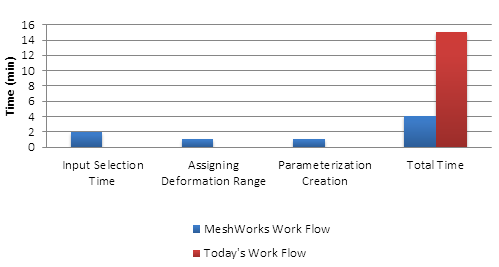 In MeshWorks Tailor Welded Blank parameters helps to select the number of TWB patches along with their patch thicknesses. 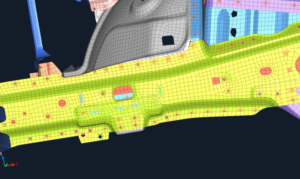 Dart parameters are created to increase stiffness for NVH applications. 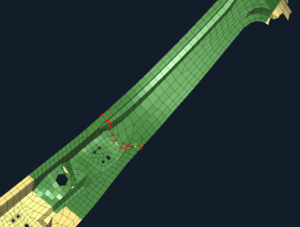 Topology parameter in MeshWorks provides user with power to move an existing cross member to different location or create a new cross member with height change. 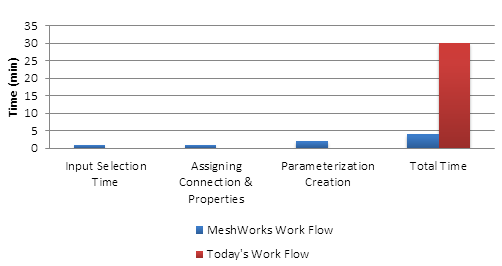 The connections are co created in MeshWorks. 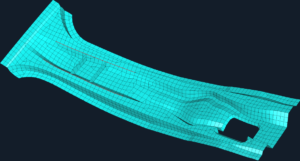 Tetra ribs could be inserted into the models without waiting for CAD as we try to implement the finding from topology studies for further strengthening the housing or as a user defined rib addition based on engineering judgement. 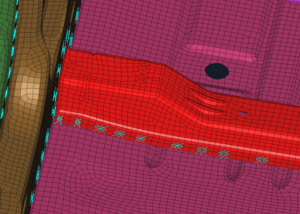 Create lightening pockets on vehicle panels or cross-members in order to reduce mass or increase stiffness without waiting for CAD data in MeshWorks.